This cruiser had a holley 2300 (350 CF) series two barrel in it when I bought it. It ran great and had major get up and go on the road, and gave decent gas mileage. 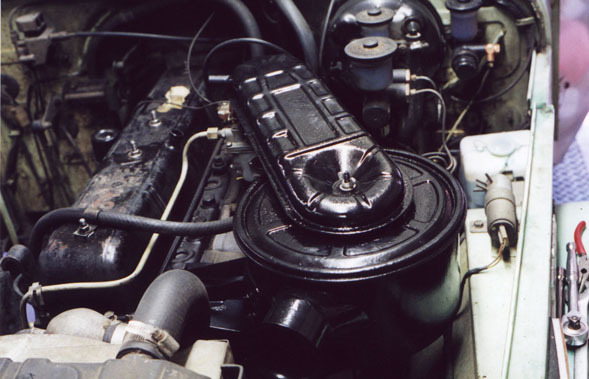 It was simple to work on, parts for it are readily available, and Holley's web site was very helpful in explaining the technical ins and outs of this carb. It did have a couple of problems though. One annoyance was that the throttle cable had been jury rigged to clamp onto the linkage of this carb, and it was prone to breakage because the cable stress point was not properly relieved. 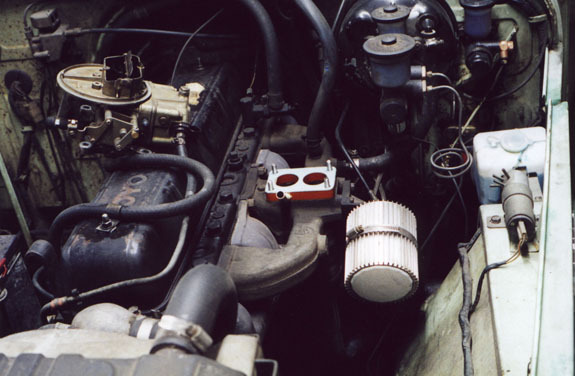 Another problem was that the open air cleaner assembly, a generic aftermarket unit, could only hold a dinky element, any larger and it wouldn't clear the brake master cylinder, and I couldn't find any that were much taller and were also that small diameter. You can see the clearance issue in the photo below, taken before any wrenches were turned. But the biggest problem came when attempting to wheel. I didn't realize what the problem was when I first got on steep inclines and the engine wanted to stall. Then it was explained to me that Holleys have a tendancy of spilling fuel from the float bowl right into the throttle body, bypassing all the metering of the throttle valves. Not only steep inclines, but any major bump or jar and the thing would want to flood. I soon learned that this was not what I wanted if I was going to do any serious off-roading in this rig. 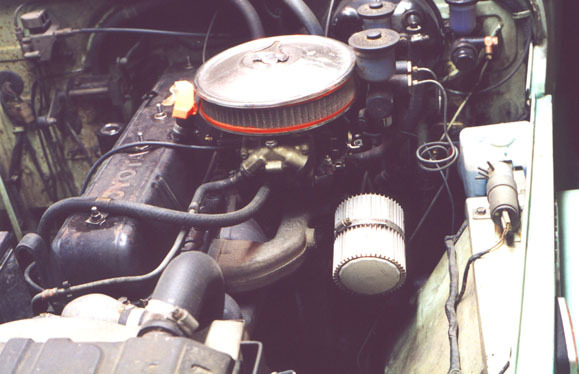 Mark Whatley, tech editor of Toyota Trails, has long advocated the stock Aisin carb as the best carb for a stock F or 2F. 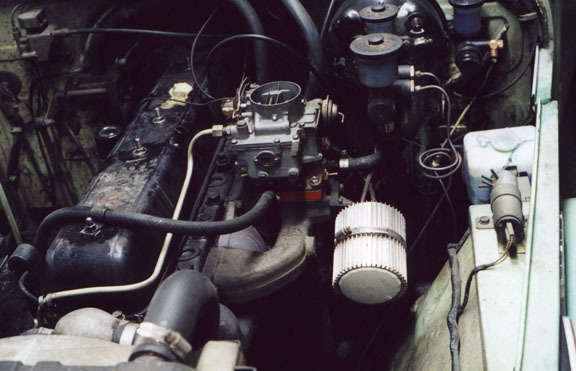 His position is, a properly set up stock carb can do as well as any aftermarket carb. A lot of my buddies run Webers, either 32/36s or the more popular 38/38s. They have a reputation as being a good aftermarket carb for a Land Cruiser, and have proven themselves. A new Weber kit runs about $380 or so before shipping. A rebuilt stock carb runs between $200-$300, depending on who's doing the rebuilding and whether you have a core to rebuild. Jim Chenoweth has a reputation in the Land Cruiser community as a master carburetor builder, and I decided to buy a rebuildable core from him and have him rebuild it and send it to me. Because the throttle cable had been cut off at the end to accomodate the makeshift Holley linkage, I ordered in a new throttle cable. 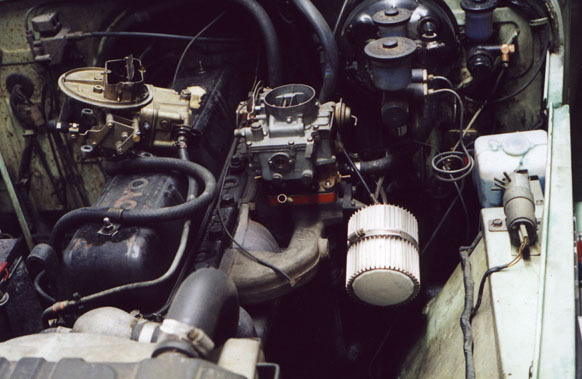 And also for the Holley, the fuel line had been cut off so a length of rubber fuel hose could adapt up to it. So a new fuel hardline was ordered in from Burt Toyota. Of course a stock air cleaner housing would be needed, so brother Bruce Westlund donated the old housing from Jethro. It wouldn't be the first time Jethro donated parts to this Cruiser, but that's for a different tech tip writup. The first thing I discovered was that the bolts that held the Downey Cruiser manifold to Holley adapter plate would not clear the sides of the carb, and even if they did they weren't long enough. A quick trip to my local hardware store came up with 8mmx1.25mmx45mm bolts. I cut the heads off, dressed up the threads and used them for studs. 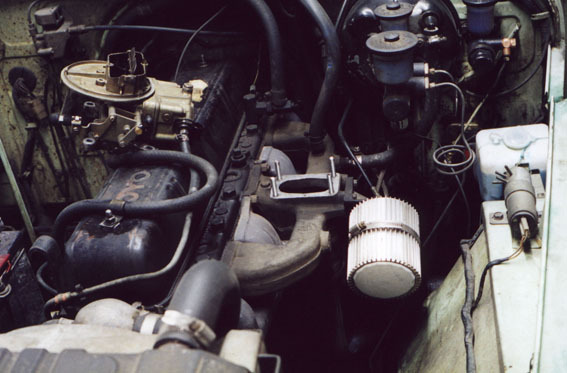 In the shot below, you can see the "insulator", with pipe for PCV valve setting on those homemade studs. To the left, on top of the valve cover, is the old Holley, just in case this doesn't work I can still put it back on to get to work in the morning. In the next shot, the rebuilt Aisin is set onto the studs. Interesting contrast, the two carbs side by side. Next the new fuel hardline gets installed. Then the PCV valve, the choke cable and the throttle cable. Finally, the air cleaner housing is installed. I have been more than pleased with the results of my conversion back to stock. Power is good, mileage is excellent (15-17 MPG both on and off road). Toyota air filter elements, while more expensive, last many months instead of one trail ride apiece. But the most important thing is that I can wheel with confidence, and not worry about the engine stalling out just when I need it the most on a steep incline or over rough terrain. Hills that once stalled me out could now be walked up at just over idle, and throttle setting was much more useable. I would recommend staying with the stock carb and having it rebuilt if you are having carb problems, or if you have a Holley going back to stock like I did. I haven't owned a Weber so I can't comment a whole lot on first hand experience, other than what I've seen in my friend's rigs. But I think the stock Aisin ROCKS when it's set up right. Email me for more details if you have any specific questions. Happy Cruisin'!